AUGUSTA -- The front porch of the apartment building at 32 Court St. offers a great view of the construction site of a new courthouse bordered by Winthrop, Perham and Court streets. AUGUSTA — The front porch of the apartment building at 32 Court St. offers a great view of the construction site of a new courthouse bordered by Winthrop, Perham and Court streets. The tenants in the seven-unit building, and other nearby households, get to hear and feel the construction, as well. They rock to the rhythm of 276 piles being pounded into bedrock to anchor the four-story courthouse. They hear the beep, beep, beep of the trucks and loaders backing up to deliver or cart off material. The noise carries across and along the Kennebec River. Work begins at 7 a.m. and ends at 5 p.m., a restriction that takes into account the residential neighborhood, but is small comfort to the apartment tenants and some other nearby homeowners. “I don’t have to set my alarm clock any more in the morning,” said Rep. Matt Pouliot, R-Augusta, who lives on Winthrop Court, within sight of the project. Pouliot is on the city’s Planning Board and saw the project proposal in its initial stages. But the Augusta legislator has heard no complaints about noise or the project, which is being managed by Consigli of Portland, and neither have others involved with the project. “As a representative of that district, I have not received any calls or complaints,” Pouliot said. “I think the public notice process of that project was well done. Consigli appears to really do a good job with public awareness. I think that preempted a lot of complaints that would have occurred. Across Winthrop Street, however, the constant racket has gotten to Shannon Perkins, who has lived in an apartment at 32 Court St. for about a year. Scott Theriault, who also lives in the building and who does maintenance on it via his company, All-Trade Services, took a more philosophical approach. He said the worst part for him is watching some of the effects, including the cracking plaster on the apartment building itself. Tenants in two other units in the building said the construction had little effect on them. One man said he works in construction himself, so he’s used to the accompanying noises. Another man said he appreciates the fact that the work hours are limited. A sign posted on a fence reminds those driving onto the construction site that they’re working in a neighborhood and to be respectful of that fact and of the work-hour limits. The neighborhood of Perham Street and Winthrop Court and some other nearby buildings, including the Kennebec County jail, have lived through the razing of the former home of Crisis & Counseling Centers, Inc., and of the Augusta Spiritual Church. 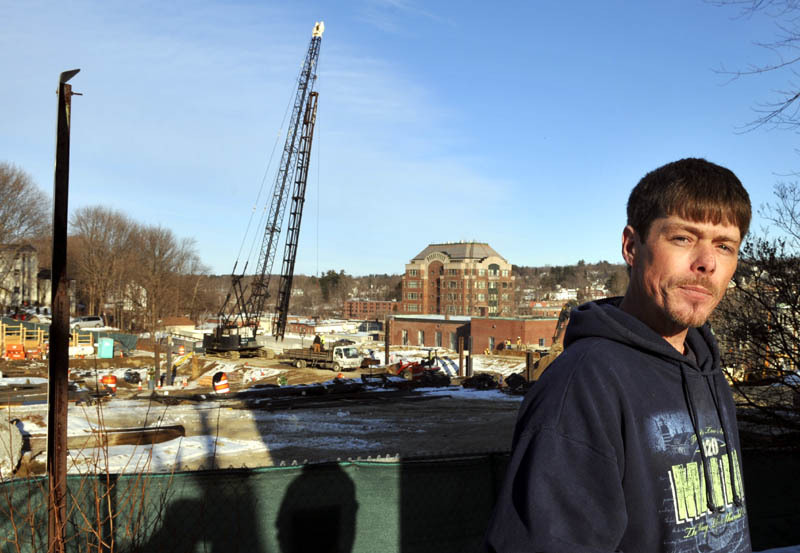 Gregory Roy, owner of 32 Court St., and a Realtor affiliated with The Maine Real Estate Network, said the fallout from the courthouse construction has done some damage to the building and perhaps to the occupants’ psyche. “I believe it may have resulted in some unhappy tenants from time to time and may have resulted in one or two vacancies that had to be filled,” Roy said. Occasionally, his renters are people who work at night and try to sleep during the day, he said. “It’s easy enough to find new tenants; it’s just making the living conditions unhappy, and when they move out, it costs money to move new tenants in,” he said. Roy, who has owned the building for 17 years, has listed it for sale at $179,000 on The Maine Real Estate Network. He said there have been efforts to purchase it from him. The new, four-story courthouse will link to the existing superior court building and house a number of court and judicial functions currently spread throughout downtown Augusta. 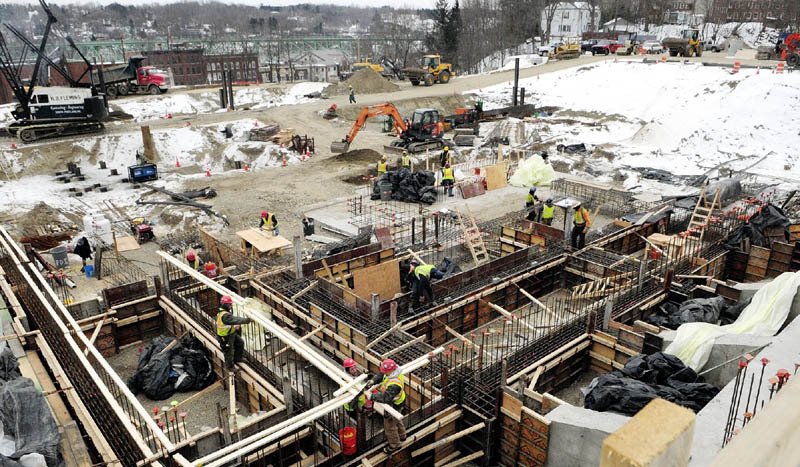 Some $62 million in bonds were authorized to pay for the Augusta courthouse construction, which was estimated in 2009 to cost $55 million, as well as planning for two other courthouse construction projects. Last week, more than three dozen workers in hard hats and safety vests directed the pouring of concrete, which would be sheltered by plastic and warmed by propane-fire heaters, so it will could set during frigid temperatures. Workers carried long lengths of rebar, built boxes of wood, checked uprights with levels and moved earth with loaders, dump trucks and skidders. The work concentrated largely on the basement level of the new courthouse. Philip A. Johnston, owner’s project manager for the Augusta Court Facility, said the project is on schedule and running a little below budget. He offered a little relief for the neighbors: Pile driving and the related clanging will be completed early next month. Form work and reinforcing for the elevator shafts and stair towers will begin a week later. The structural steel is scheduled to be erected this spring and summer, Johnston said. “The major retaining walls and subsurface piping has all been completed and parking lots have been brought up to rough grade,” he said. The foundation work will continue for some time and at the height of construction, which he anticipates to be a little over a year from now, some 150 workers will be on site. The new courthouse is expected to be completed by the end of 2014 or the beginning of 2015. Then, six months of renovations will begin to the existing courthouse, finishing by the summer of 2015. “It’s coming in under budget, and on target to be under budget,” Johnston said. The courthouse project was divided into four contracts: demolition and site utility work, mass excavation and pilings, concrete and steel and elevators, and finishing work. Johnston said he has not been notified of any damage caused by the construction projects. Doing such a large project in a confined space in a residential neighborhood presents challenges including complications involving delivery of materials and storage of them.